Schools, a town , now our county… oh my! 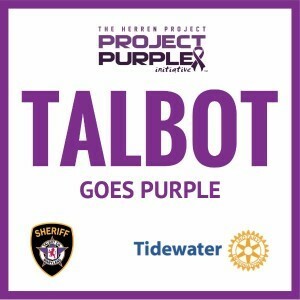 Talbot Sheriff Joe Gamble, in partnership with Tidewater Rotary Club, is leading the charge for Talbot to be the first county to ‘go purple’ participating in an initiative of The Herren Project, a nonprofit foundation established by former NBA basketball player Chris Herren, aptly named ‘Project Purple’ that assists individuals and families struggling with addiction. Several prominent local businesses have stepped up to the plate to help with this initiative including Easton Utilities, Shore United Bank, and Mid Shore Community Foundation just to name a few. Did you happen to catch the purple fireworks bursting in the air on the fourth of July? The Talbot Goes Purple campaign is already underway, but the big event begins in September when businesses, residents and county buildings are asked to “go purple” throughout the month. On Tuesday, Sept. 19, Chris Herren will visit Talbot County for an event at 7 p.m. at Easton High School. The goal is for everyone over the age of 12 to attend. Families – this is a FREE event, and an important one. You talk to your kids about texting and driving… why not prescription drugs? Can you believe that eight (8) percent of our Talbot County high school seniors have tried heroin?!? With funds provided by the local health department, Talbot County Public Schools will receive $5,000 in funding to add age-appropriate curriculum to all grade levels, focusing specifically on the harms related to addiction. Interested in Narcan/Naloxone training? The Talbot County Health Department offers them FREE the first Tuesday of every month! This is a huge educational moment in our community and Gamble hopes that the whole county will come together and spread awareness of the dangers of substance abuse and encourage positive decision making to navigate life’s challenges. Parents: Have a new conversation with your kids. Talk to your kids about the dangers of prescription drugs and empty your medicine cabinets of old, unused opioids including oxycodone, oxycontin, percodan, percocet, vicodin, codeine, fentanyl, and methadone. Bring the prescriptions to any of the medication drop boxes located at the Talbot County Sheriff’s Office, Easton Police Department, and Maryland State Police barracks. Get trained in Naloxone, learn about the Good Samaritan Law and teach your kids about it, and share Talbot Goes Purple’s educational messages on Facebook. 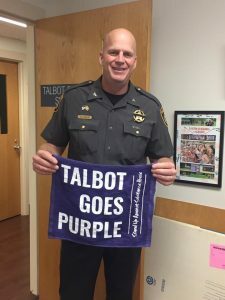 For more on what you can do to spread awareness of the campaign including requests or purchasing of materials such as car magnets, window clings, brochures, rally towels, etc., visit www.talbotgoespurple.com or find Talbot Goes Purple on Facebook @TalbotGoesPurple. The website also has resource information for parents, including hotlines, treatment providers, and support services for those struggling with addiction. Until Chris Herren gets to town, be on the lookout for purple ice cream, a purple courthouse (ceremonial lighting @ 7:30pm on Sept. 18), and one-eyed, one-horned, flyin’ purple people eaters in the month of September.